Good headphones are crucial not only while shooting on location on on set but also editing if you wear headphones while editing (instead of listening to the sound on speakers as some editors prefer to). In our opinion, the best headphones for filmmakers and editors are comfortable, durable, and produce high quality sound. 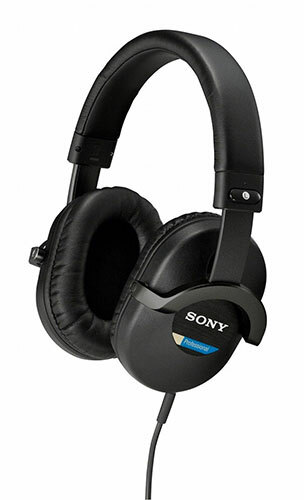 The venerable Sony MDR7506s are the standard headphones for the film & video industry bar none. They’re popular among location sound mixers, they’re popular among editors, they’re popular amongst almost everyone. They feature large, comfortable earcups that don’t hurt your ears after wearing them for hours on end, a generous 10 foot coiled cable, and even come with a 1/8th inch to 1/4 inch headphone adapter. These pro audio headphones also fold in amongst themselves and come with a handsome black leather carrying bag. 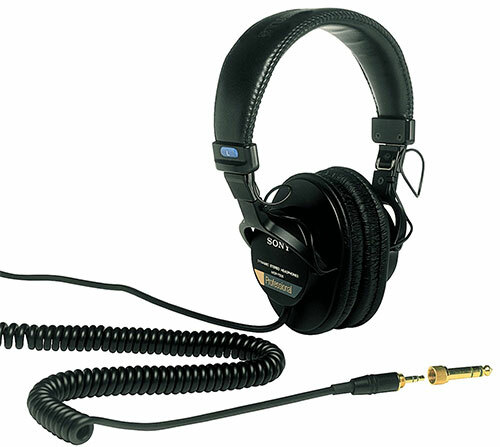 The Sony 7506s have been around since 1991 and they remain a popular choice today among broadcasting and radio professionals as well. 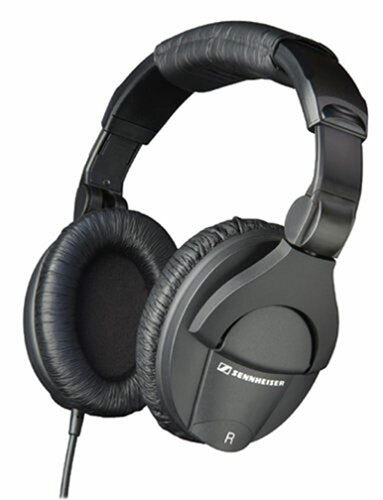 The 7510 is a newer cousin model to the 7506 with a wider frequency response than Sony’s original pro headphone line. The 7510 also has a long coiled cable and noise isolation earpads. The 7510 is starting to get attention in the filmmaking community among editors in particular. For an additional upgrade over the 7510, check out the 7520 which has a detachable cable so you can swap out the default coiled cable with a straight cable if the former gets twisted a lot in your use. These are closed ear headphones. Comes in a reusable box and also includes a soft pouch for everyday storage. 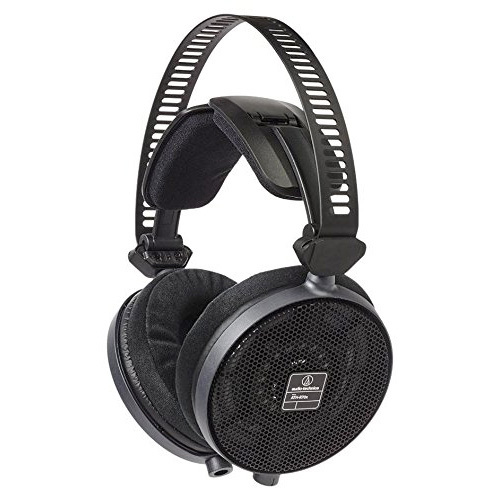 The Sennheiser HD 280 professional headphones are favored by some audio editors and sound mixers simply because they can be more comfortable than the 7506s. They are dynamic closed ear headphones which also feature excellent sound reproduction and a wide and accurate frequency response. Like the 7520, the Sennheiser 280s offer a user replaceable cable, meaning you can swap in a cable of your preferred length (either a straight headphone cable or a coiled headphone cable). Also comes with a 1/8th inch to 1/4th inch stereo headphone adapter. 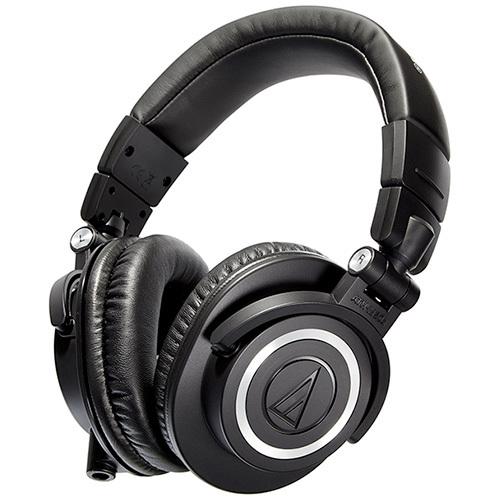 The Audio-Technica M50x is another great pair of professional studio monitor headphones for video editing. They feature extremely high quality sound reproduction and a design that offers comfort even when worn for long periods of time. They offer a step up in terms of padding and ergonomics over their younger sister model, the ATH-M40x. These headphones also offer good sound isolation abilities which allow you to buckle down and get work done– even if there’s noise in your surrounding environment. Also of note: these high end AT headphones have a detachable coiled headphones cable which makes it easier to untangle them if they become tangled (or replaced if it gets frayed). If you wear headphones for most of the day while you’re doing video editing or doing other tasks, you probably already know the feeling of your ears getting tired of wearing them. This pair of professional open backed Audio-Technica ATH-R70x headphones is designed for you. With premium comfort fit padding, adjustable winged support system and brilliant sound reproduction and precise high frequency response, these stand out head and shoulders above many of the rest. They’re also extremely light: just under 8 ounces so it barely feels like you’re wearing them at all. These headphones are meant for sound mixers, engineers, composers, and video editing professionals and they’re also a bit pricer with that in mind as well. Includes detachable straight cables. Durability The Sony MDR-7506s are well known workhorses that get taken into the field with location sound mixers, boom operators and others and get quite a lot of abuse. On the other hand more delicate ‘phones like the ATH-R70xs are meant for studio use and not necessarily a pair you want to be taking everywhere you go. Do I need detachable cables? Some pro users can’t stand headphones that don’t have detachable cables and others don’t care. But if you’re used to high end headphones with detachable cables, you might want to consider that as a factor. Also, whether or not the headphones have coiled cables or straight cables is a similarly important factor. Price? Actually this consideration is less of a factor here. For professional users, all of these headphones in this article are fairly affordable with the average set of cans being around $100– a far cry from some of the less reasonable “audiophile” headphones that rich guys buy to make themselves feel fancy. If you’re a pro user we’d encourage you not to think so much about price and more about the amount of time that you’re going to be spending wearing these headphones for video editing or whatever your use case may be. The comfort of your ears and the quality of the product is paramount for you above all else. Perhaps the exception might be if we were kitting out a whole studio with headphones or needed something durable to bring with us out into the field (in which case we’d probably just grab the MDR 7506s and call it a day). Comfort For many users, lighter headphones are more comfortable, and it’s hard to beat the ATH-R70x in that department. They also feature a unique winged design that makes them “float” above your head instead of compressing your hair, which some users may find more comfortable. What are the Best Voiceover Microphones for Narration?